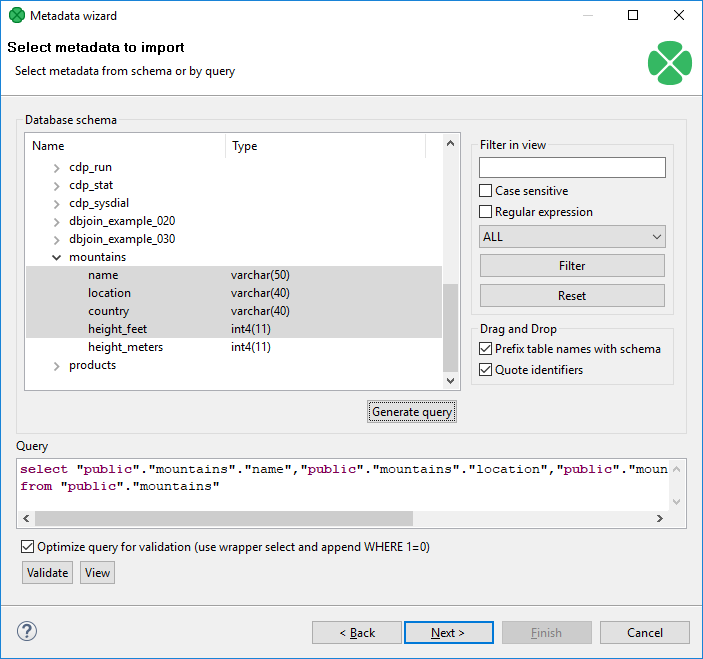 If you want to extract metadata from a database (when you select the Extract from database option), you must have some database connection defined prior to extracting metadata. In addition, if you want to extract internal metadata from a database, you can also right-click any connection item in the Outline pane and select New metadata → Extract from database. After each of these three options, a Database Connection properties dialog opens. 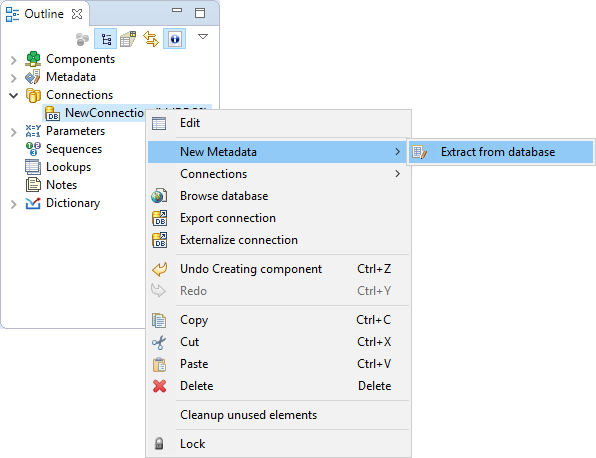 In order to extract metadata, you must first select database connection from the existing ones (using the Connection menu) or load a database connection using the Load from file button or create a new connection as shown in the corresponding section. Once it has been defined, Name, User, Password, URL and/or JNDI fields become filled in the Database Connection wizard. Then you must click Next. After that, you can see a database schema. Either you write a query directly, or you generate the query by selecting individual columns of database tables. If you want to generate the query, hold Ctrl on the keyboard, highlight individual columns from individual tables by clicking the mouse button and click the Generate button. The query will be generated automatically. If you check the Prefix table names with schema checkbox, it will have the following form: schema.table.column. If you check the Quote identifiers checkbox, it will look like one of this: "schema"."table". "column" (Prefix table names with schema is checked) or "table". "column" only (the mentioned checkbox is not checked). This query is also generated using the default (Generic) JDBC specific. Only it does not include quotes. 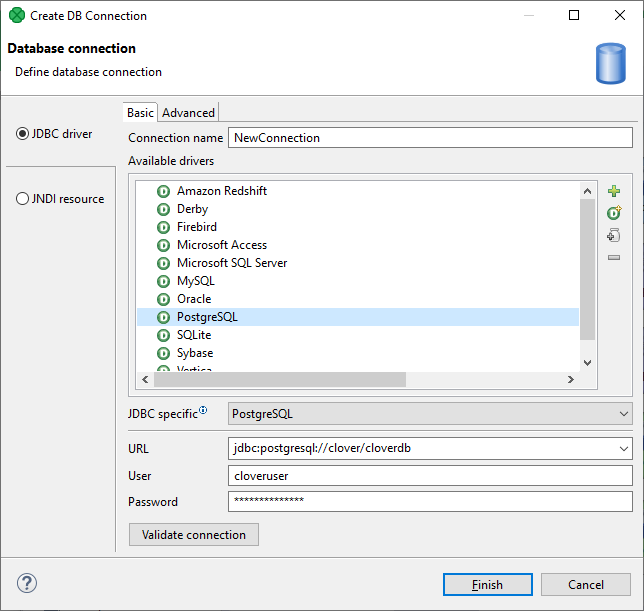 When the default (Generic) JDBC specific or Derby specific are selected for corresponding database, the generated query will not be quoted at all. Once you have written or generated the query, you can check its validity by clicking the Validate button. By clicking the Finish button (in case of internal metadata), you will get internal metadata in the Outline pane. On the other hand, if you wanted to extract external (shared) metadata, you must click the Next button first, after which you will be prompted to decide which project and which subfolder should contain your future metadata file. 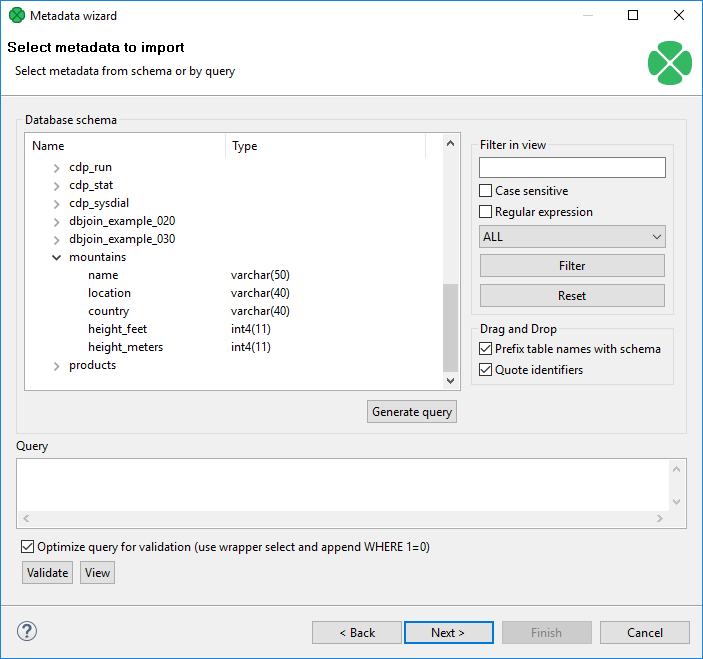 After expanding the project, selecting the meta subfolder, specifying the name of the metadata file and clicking Finish, it is saved into the selected location.